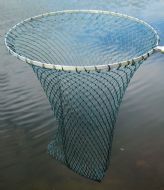 We have an excellent range of replacement nets bags suitable for a wide range of trout, sea trout and salmon landing nets. 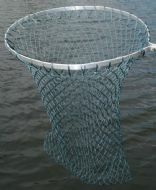 These nets are fish friendly. 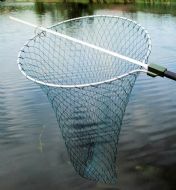 The KL1 is our Stream Net Bag, suitable for frame sizes between 10" and 14" diameter, while our KL4 is our most popular size and is suitable for both Trout and Sea Trout frame sizes between 16" and 20" diameter. Both net have a 3/4"/20mm square mesh. 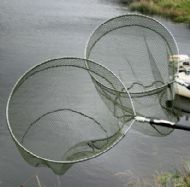 KL17 and KL20 net bags fit our existing range of trout and sea-trout landing nets and have a fine 3/8"/10mm hexagonal shaped soft mesh, with a flat pan shaped bottom. For customers outside mainland UK - Northern Ireland, Outer Isles of the UK, EEC Countries and countries outside the EU, please either telephone 01466 794415 or email sales@sharpes.net for a carriage/postage price; this will be less that currently shown on our website.